St Kilda is an inner suburb (neighbourhood) of the metropolitan area of Melbourne, Victoria, Australia, 6 km south-east of Melbourne's Central Business District. 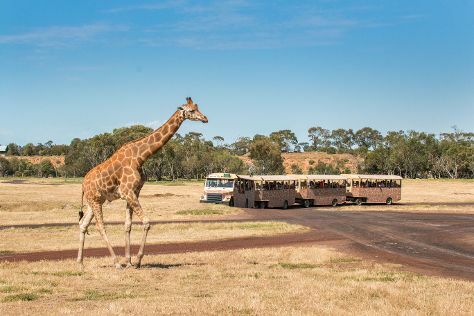 Get outdoors at Werribee Open Range Zoo and Damper Creek Reserve. Attractions like St. Kilda Beach and Scienceworks make great kid-friendly stops. The adventure continues: enjoy the sand and surf at Brighton Beach, tour the pleasant surroundings at Kalang Park, find something for the whole family at Luna Park Melbourne, and stroll around Glen Iris Park Wetlands. To see reviews, maps, more things to do, and tourist information, use the St Kilda trip planner. Melbourne to St Kilda is an approximately half hour car ride. You can also take a train; or take a bus. In April, daily temperatures in St Kilda can reach 23°C, while at night they dip to 12°C. Wrap up your sightseeing on the 6th (Sat) to allow time to drive back home.